This is my second post on Gregory Crewdson’s photography, whose exhibition at the CCP has left such an indelible impression on me. His Beneath the Roses series has a second strain that, unlike the previous interior mise-en-scènes, concentrates on the exterior of the middle-class suburbia. Once again we are presented with an alternate, dystopian vision. We are witnessing an aftermath of an apocalyptic nightmare that left a lot of people destitute and wandering around the deserted streets with their meagre belongings in a nonchalant, almost zombie-like state. But not everyone seems to have been affected equally by whatever ills may have befallen the community. The same street that has houses reduced to rubble, or that are windowless, boarded up, with huge gaping gashes in the walls and roofs, at times with fiery infernos raging on the inside, has other dwellings that are perfectly preserved, with green manicured lawns and elegant flower beds. 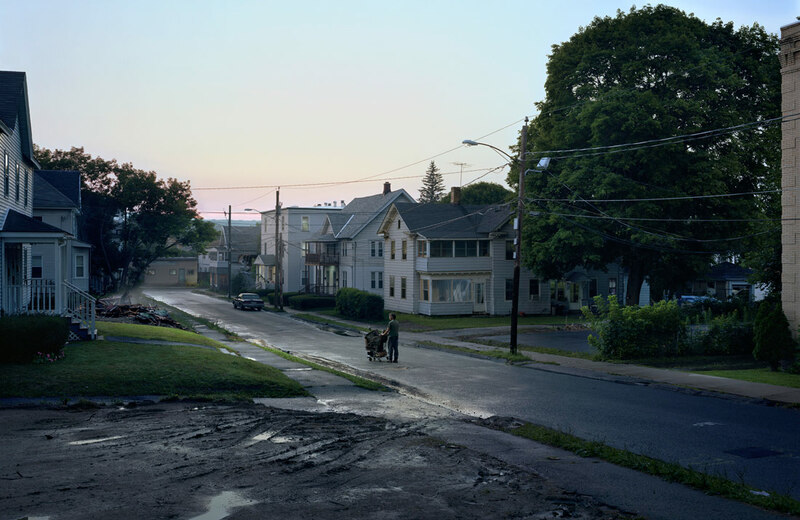 One cannot go past Crewdson’s photographs without commenting upon the sheer excellence of his management of the photographic medium. These works are of truly vast size, but despite the physical dimensions and the amount of visual information they contain, each detail appears in an incredibly sharp focus. There is no doubt that careful choreography, lengthy stage setting processes, costly equipment, large lenses, and perhaps a certain amount of digital enhancement and manipulation would have gone into the creation of each image, but the narrative power and the psychological depth of each of the resulting works serves to justify again and again the relevance of photography as an art form, for within these images, the artist creates the proverbial “paintings with light”. I came to this exhibition with a negative preconception – not another boring landscape exhibition! However, I must admit that I have enjoyed Master Landscapes of the Mornington Peninsula: 1800 to the Present at the Mornington Peninsula Regional Gallery more than I expected, to a point. 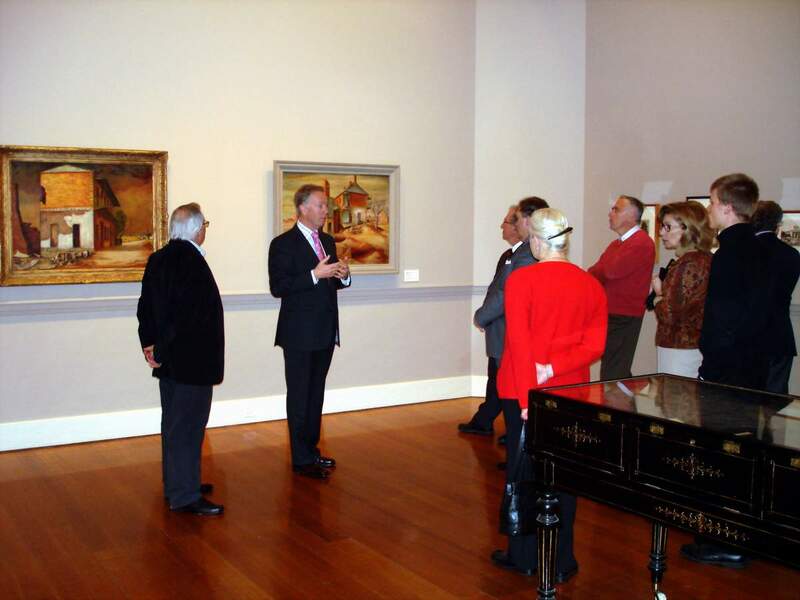 The exhibition encompasses works from the early 19th century to the present day. Each work is accompanied by a wall panel with the map of the Peninsula, with the red dot indicating where each artwork has been produced, or (in the case of studio painters like von Guérard) which area it is depicting. This shows the depth of curatorial research as opposed to a more relaxed attitude of including a random selection of works with a vague coastal theme that might or might not be of this particular area. These little maps were certainly a hit with the locals, who were crowding the exhibition space, attempting to recognise or pointing out familiar spots and preserved landmarks. The exhibition begins with hand-coloured prints by Louis August de Saison and watercolour sketches by Georgiana McRae from the 1830s. These are followed by a delightful sketchbook and several drawings by Eugène von Guérard, as well as three of his romantic landscapes of the area. The second one, Castle Rock (1865) shows most delicate effects of setting sun on the bay and nearby rock faces. Schapper Point (1870) is representative of his “portraits” of sprawling colonial estates, and shows how carefully he traced tree branches and foliage, and meticulously recorded the details of the landscape. 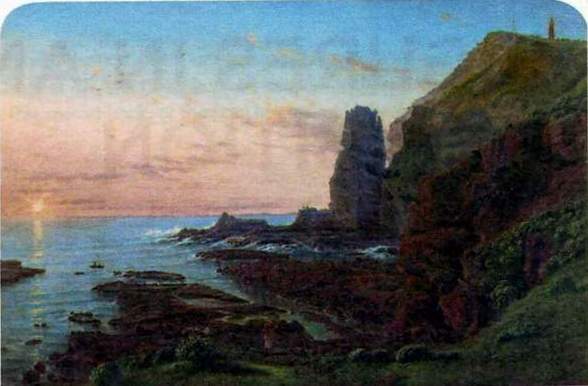 Only two years separate this painting and Nicholas Chevalier’s Cape Schank of 1872. Yet Chevalier appears by far more “modern” by comparison in terms of atmospheric effects and looser painterly technique, which is especially evident in his handling of water sprays breaking over the edges of the cliffs. Louis Buvelot’s painterly technique is closer in spirit to Chevalier than to von Guérard. His Mt Martha of 1877 shows that merely ten years after his arrival in Australia he no longer interpreted this country through the European palette (as can be seen in her earlier paintings at the National Gallery of Victoria), but adapted his colours to capture the peculiar Australian summer hues of yellows and muted greens. There is a charming Henry James Johnstone’s Swamp near Dromana of c.1875. 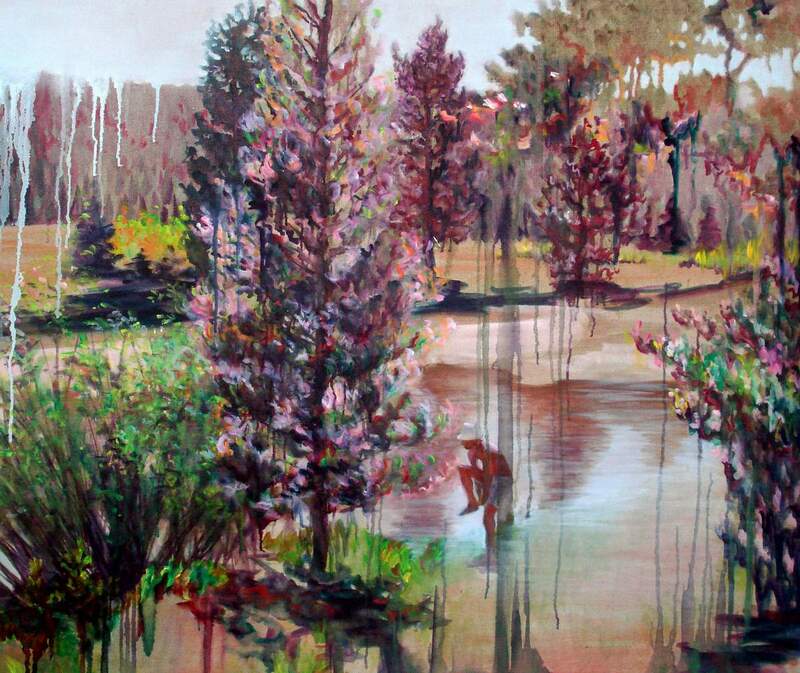 It is very similar to his large-scale compositions, seen once again in the collection of the National Gallery of Victoria as well as numerous art auctions, and features his trademark foreground tree stump with reflecting pool of water in the middle ground. Given the miniature scale of this painting, these details appear endearing rather than imposing. 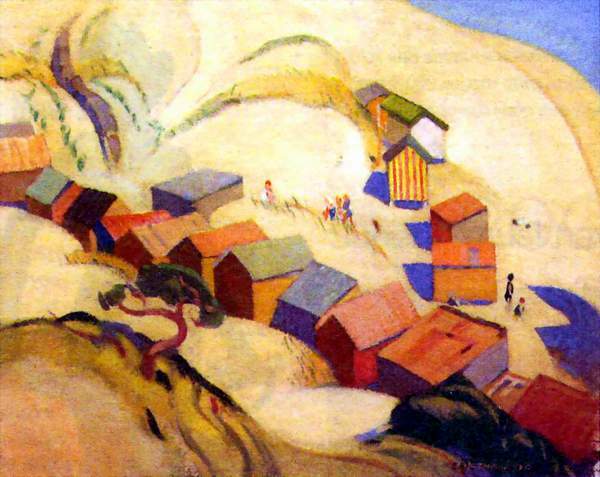 Ambrose Patterson’s Bathing Boxes, Mornington, of 1913, became a virtual carte-de-visite of the exhibition, perhaps due to a distant relation of the painter to the gallery’s acting director, Jane Alexander. There is little to be added about it beyond what has been written already in numerous articles and press-releases. The painting is fresh and well-executed; the artist’s rapid brushwork captures effects of the sunlight on gaily dressed bathers, white sand, and foliage, very much in the tradition of Impressionism (albeit more than forty year after the Impressionist movement first appeared in Europe). Otherwise it is quite mundane, improving little on the Diana-with-her-bathing-maidens prototype by Boucher and his Rococo milieu. I always preferred later paintings by Arthur Streeton to his earlier Heidelberg era pieces, which were painted when the artist was barely 20 years old. 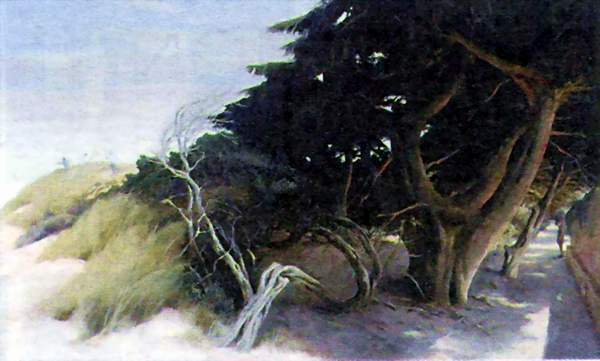 His View from Barnett’s Point of 1921 is a good example of the artist’s mature style. 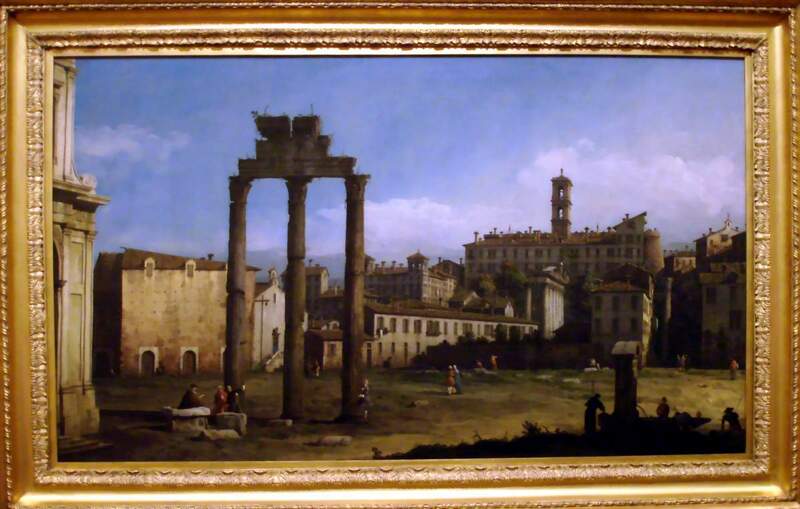 These later works display a greater confidence in building a solid composition, and more assured approach the handling of colour, enhanced with superb effects of sunlight and shadow. The painting is literally flooded with light. Penleigh Boyd’s contemporaneous Portsea of 1920 is a more meditative exercise. The artist concentrates on capturing the delicate colour effects of the bay – as opposed to Streeton’s sparkling painterly bravura. The subtle gradations from purples through blues and greens to the lightest hues of azure are superb and effectively contrasted against the darkened greens and browns of the shoreline. The inclusion of two works by Eric Thake is interesting, surprising, and refreshing in the context of such a traditional exhibition. His elegantly constructivist Bathing Boxes of 1930 is fresh and colourful, while the later Bass and Flinders of 1943, in a surrealist / metaphysical vein, sums up the region conceptually in terms of history, geology, and fauna, and is perhaps the only work in the exhibition without obvious references to the landscape tradition. 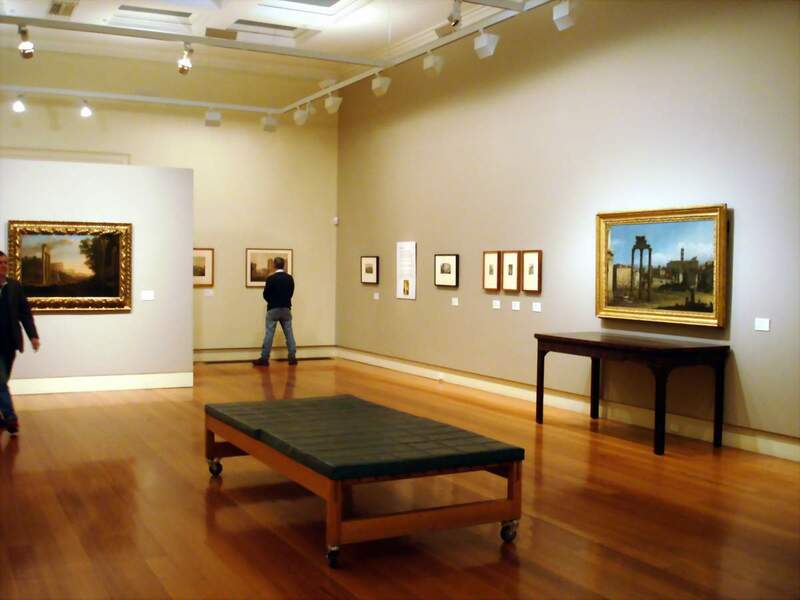 Australian moderns – Arthur Boyd, John Perceval, Albert Tucker, and Fred Williams – are given a large chunk of the gallery’s exhibition space. This is in part due to the fact that the Boyd family were a conspicuous presence on the Peninsula as demonstrated in this exhibition by works by Penleigh, Emma Minnie, and Arthur Boyd, and Arthur’s portrait of Merric Boyd sketching; as well as the fact that the Boyd and McCulloch residences on the Peninsula were a welcome retreat to a number of artists who used the opportunity to portray different aspects of the region. There is a striking early Arthur Boyd’s Swan Flying through the Orchard of 1959, with deliciously thick blobs of pigment to denote the orchard ripe with apples, colourful clothing of fruit gatherers, and a white lightning flash of a swan dashing through the picture plane. Albert Tucker’s Blairgowrie of c. 1970, which is otherwise one of his most lyrical compositions of bathers near a rock pool, is remarkable for its inclusion of three circular crater-like cave formations, which are reminiscent of the trademark craters that puncture his heavily-textured paintings. John Perceval’s Broken Tree and Frog of 1968 comes from one of the most remarkably creative periods in the artist’s career. The paint-laden brushstrokes outline gnarled tree trunks and tall grasses swaying in the wind; the darkness of the foreground is effectively contrasted against the light-filled paddocks in the middle distance. There is also a striking triptych by Fred Williams, Sorrento Beachscape II of 1971. It is a magnificent creation, a minimalist concoction of aerial bay views in muted colours. They are possibly paintings of the same spot seen from several vantage points, a Cubist approach to landscape painting in Williams’ practice as pointed out in the Cubism exhibition at Heide. The “contemporary” section of the exhibition (i.e. the works produced within the last twenty years) is limited to barely seven paintings, three of which are by Rick Amor – not that I am complaining! The artist grew up in the area, and the region features prominently in his paintings. His The Rock and the Sea of 1990 is powerful and menacing, threatening the shadowy silhouette of a man on a jetty with the giant looming rock formation and the unbridled force of the stormy sea. On the Beach of 2002, with its desolate wind-swept foreshore and brooding skies provides an interesting contrast to Stewart MacFarlane’s fresh and sunlit The Last Days of Summer of 1993, which is saturated with bright blues, pinks, yellows, lime greens, and purples. It is a characteristic ‘still’ from an unknown suspense drama or a movie thriller, the narrative of which was concocted in MacFarlane’s wild imagination. Amor’s The Fort of 2004, with its bent tree trunks and sinuous branches (and with the inevitable emotional drama played out in the darkened side margins of the painting) sharply contrasts with Ken Smith’s almost sterile in its painterly crispness Road to Sea 7, of 2008. The painting is anchored compositionally by a strong geometric pattern of a bridge which crosses the width of the painting; the sense of stillness is heightened by the symmetrical reflections in the water. The exhibition concludes with Lynn Boyd’s dreamy and meditative Azimuth of 2004, a fitting inclusion which allowed me to rest my eyes in its abstracted depths of blues and greys before stepping into the silvery-grey abstraction of a rainy Sunday afternoon. As I drove home along the highway in traffic through the seemingly endless suburbia, a gnawing feeling arose at the back of my mind. The exhibition was certainly “nice”, but is this enough for a public gallery exhibition? Over the last twenty or so years, the Mornington Peninsula Regional Gallery has assumed the role to protect and uphold the artistic heritage of the area. This has been reflected in a number of exhibitions, the examples of such exhibitions are numerous. The ones that immediately come to mind are “The Artists’ Retreat” of 1999, “The Artists’ Journey” of 2004, “Aspendale Beach” of 2007 and “Out of the Square” of 2009, not to mention the numerous solo exhibitions focusing on works by the artists produced on or about the Peninsula. It was definitely no mean feat for Rodney James, the exhibition’s curator, to choose the works for this instalment of a region-themed exhibition without doubling up on previous efforts, and he has succeeded well in terms of the breadth and quality of works on display. 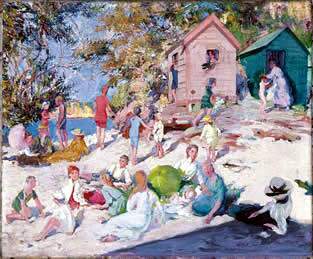 I certainly enjoyed the meticulously painted von Guérards, the sparkling Streeton, the minimalst Williams, and the brooding Amors. And while I would have liked to see more contemporary works in display, and perhaps a greater variety of media, such as photography or video projections and installations, this is purely my own aesthetic preference, which I acknowledge might be at odds with those of James. However, the critical, art historical, and analytical discourse on the Australian landscape tradition has undergone dramatic shifts and developments within the last twenty years. 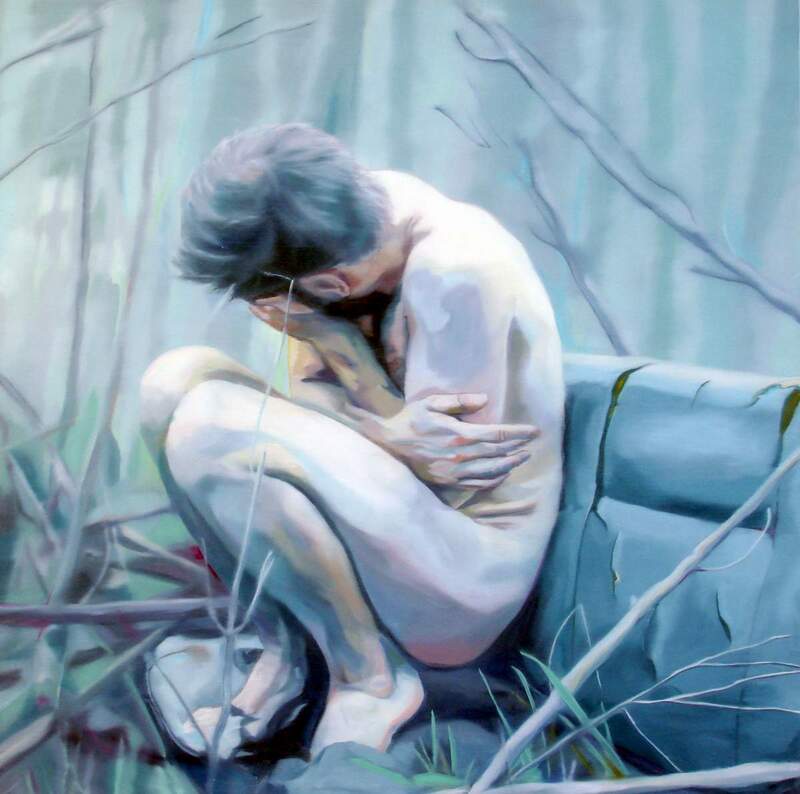 The post-colonial legacy, the meaning of the place, the contemporary dichotomies between the urban and rural, private property and public space, belonging and non-conformity, personal vision and national symbolism (not to mention the recent pressing environmental issues) continue shaping the post-modern dialogue on the meaning and significance of Australian landscape painting to the present day. So, it is puzzling why the curator chose to ignore these contemporary trends, and decided to present yet another “nice”, uncontroversial, pretty exhibition. 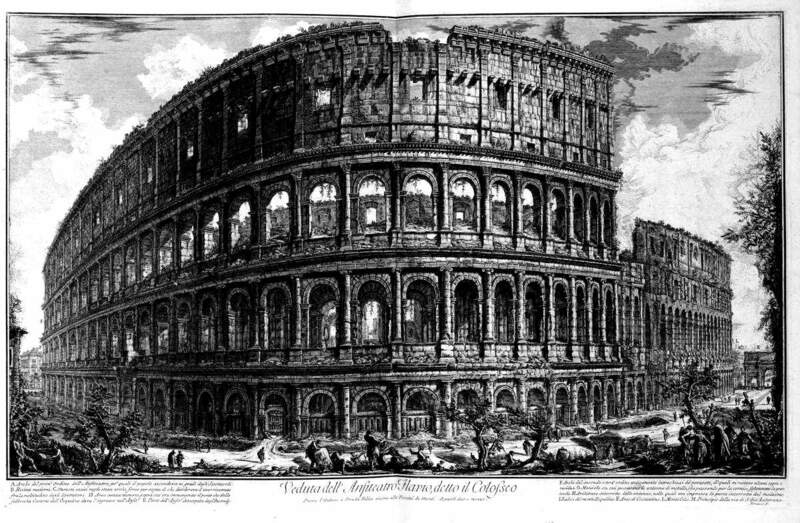 Even the exhibition brochure, which could have been a perfect arena for reflecting upon some of the issues mentioned above, once again contained stylised and disengaged “commissioned essays”. 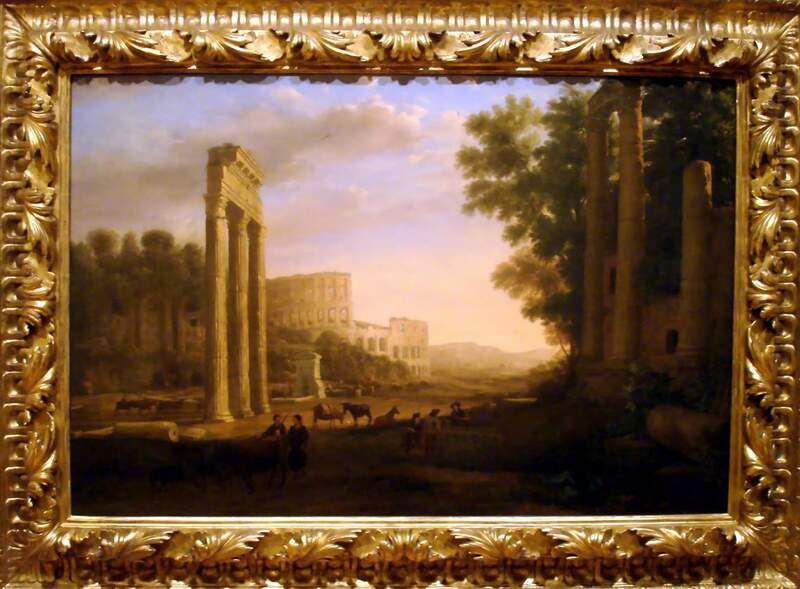 Such old-fashioned, traditional approach to displays of art is understandable in a commercial setting, and as such the Master Landscapes exhibition has a lot more in common with similar landscape-orientated displays at the Charles Nodrum Gallery or Lauraine Diggins Fine Art, not to mention regular auction offerings, which would feature comparable artworks and catalogue essays. So, I would conclude with a question. Is it enough in our day and age for a public gallery to curate an old-fashioned, parochial exhibition which is simply “nice and pleasing”, or is it fair to demand a greater international-level awareness of contemporary issues and analytical dialogues, if not in the exhibition space itself, then, at the very least, on the pages of the accompanying exhibition booklet?